Vintage 1930's/1940's Bakelite pendant with rings on a vintage belt buckle give this signed necklace an Art Deco Moderne look. Black rubber Euro cord with sterling silver end caps and large lobster claw clasp complete this unique piece. 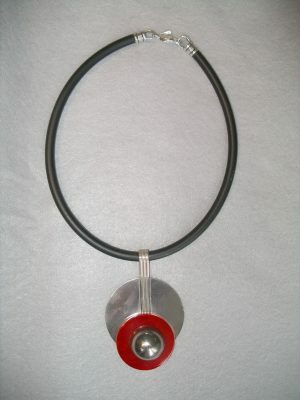 Sterling silver signed pendant features a vintage red Bakelite disc for a unique accent. 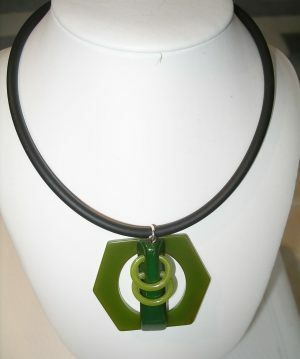 This is a striking piece and great to wear with business clothes or jeans. A black Euro rubber cord is comfortable and is completed with sterling end caps and a large lobster claw clasp.